Westporter Lauren Soloff was named President of Newtown-based Sonics & Materials, Inc. on April 5. WESTPORT — With a message of celebrating diversity, Westporter and Representative Town Meeting member Lauren Soloff became president of her family’s business, Sonics & Materials, Inc.
Soloff was named president of Sonics, an ultrasonic technology manufacturer, at the company’s 50th anniversary celebration on April 5. Her father, Robert S. Soloff, founded Sonics in Danbury in 1969, which, like 2019, were “turbulent and uncertain years,” Lauren Soloff said. Sonics’ diverse staff, which includes 85 employees at the company’s headquarters in Newtown, makes her hopeful, Soloff said. “We have employees at Sonics who were born in Brazil, England, Thailand, India, Portugal, France, Philippines, Dominican Republic, Vietnam, Cambodia, and Puerto Rico. .. We do business in no less than 125 countries, including places such as Iceland, Estonia, and Zambia,” Soloff said at the event. “When people walk through our doors, whether it be as an employee, customer, vendor, family member or friend, people sense that they are in a place where views are respected, and differences are appreciated - a place where judgement is not based on where you were born or what your diploma may or may not say — but by your unique contribution to Sonics,” she added. In 2017, Soloff, a registered Democrat, was elected to the Westport’s Representative Town Meeting from District 9. 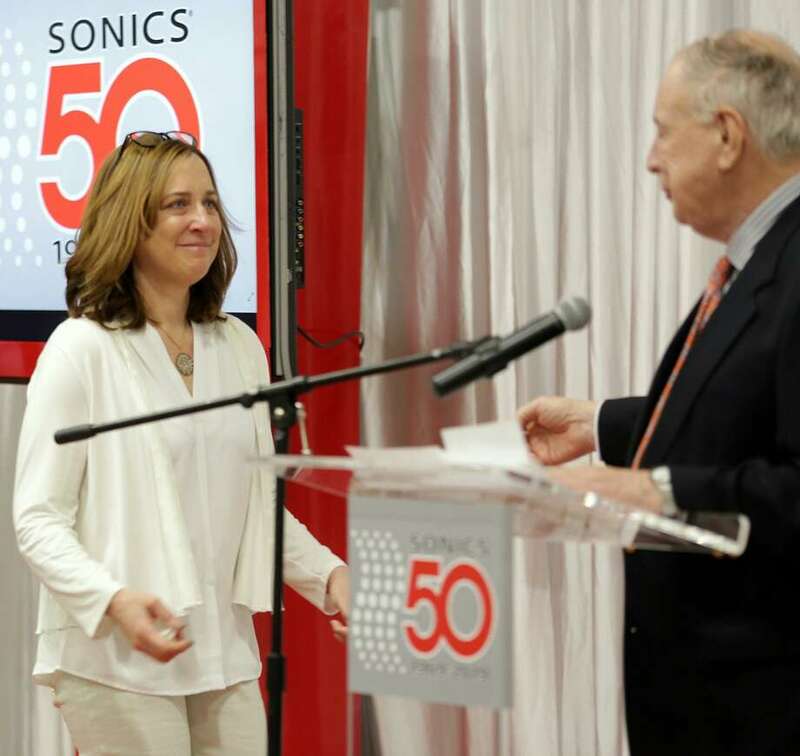 Soloff said she hopes to continue Sonics’ history of innovation, which includes 30 patents for technological innovations related to the manufacture of plastic assembly, metal welding and packaging used in automotive, aviation and medical device equipment, among other industries. “I appreciate the trust my father has shown me, as well as the hard work and support of all the Sonics’ employees who have brought us to 50 years of success,” Soloff said. State Attorney General William Tong and Westport state Rep. Jonathan Steinberg also attended the 50th anniversary celebration. U.S. Sen. Chris Murphy highlighted Sonics as his “Monday Manufacturer” last week. “I’m happy to highlight Sonics & Materials’ 50 years of service to the manufacturing sector in Connecticut and their commitment to training the next generation of students in the ultransonics field. Their hard work goes a long way to ensuring Connecticut manufacturing remains competitive,” Murphy said.